This Wednesday, April 4, is the 50th anniversary of Dr. Martin Luther King, Jr.’s assassination. 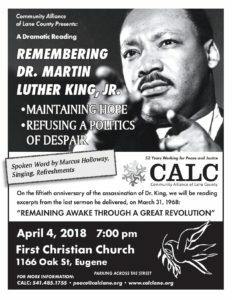 The Community Alliance of Lane County (CALC) is hosting a reading of excerpts from the last sermon King delivered, “Remaining Awake Through a Great Revolution.” The event begins at 7 p.m. and will be held at First Christian Church, 1166 Oak St in Eugene. The theme of the evening is “Maintaining Hope, and Refusing a Politics of Despair”. 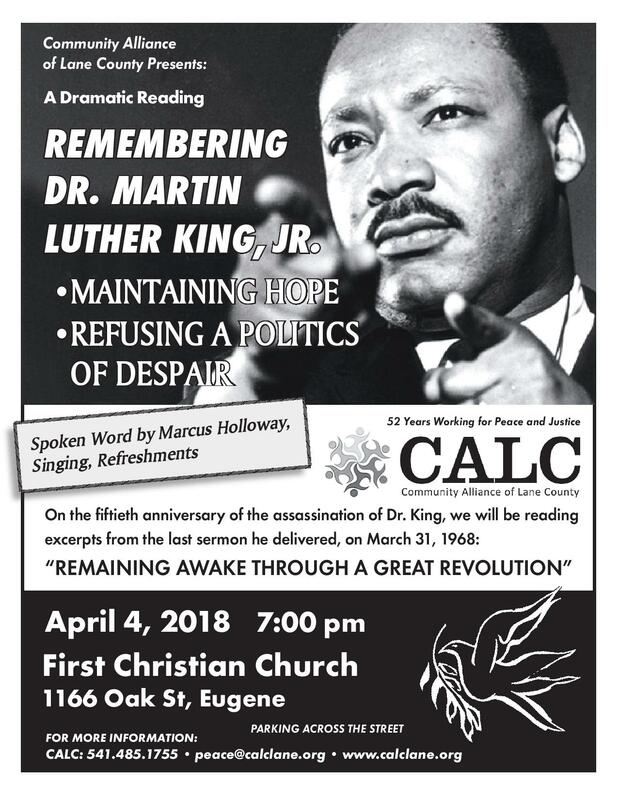 There will be spoken word by Marcus Holloway, community singing led by MLK Community Choir (Inspirational Sounds Gospel Choir), music from Greg Black, and more. Light refreshments will be provided. CALC was founded in 1966 to mobilize opposition to the Vietnam War, and continues to challenge militarism, and to evolve its mission to include education and mobilization for peace, human dignity, and social, racial, and economic justice. KEPW is proud to have them as a sponsor for the April 20 Green Earth Ball.